We offer a professional agency service for leading design companies on the markets of Baltic Countries, Kaliningrad and Belarus. Gloster is well -known for its high quality teak furniture around the world. 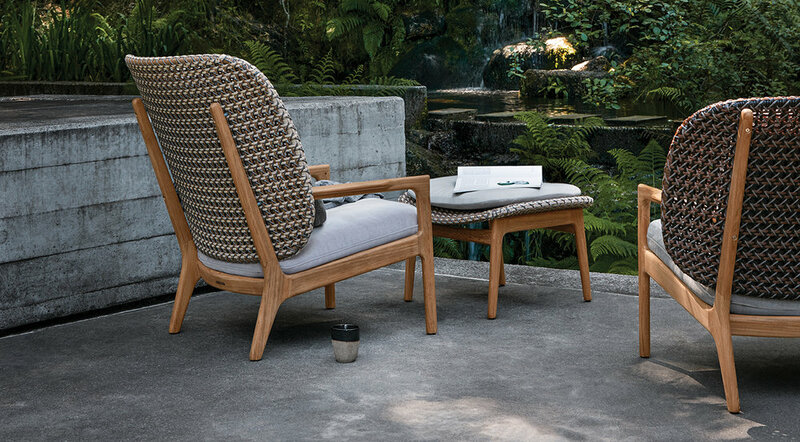 With a beautiful, soft natural finish, every piece of Gloster teak originates from carefully managed plantations and is thoroughly inspected to ensure that quality endures. A close-grained hardwood with a high natural oil content, teak is exceptionally hard wearing, highly resistant to rotting and almost impervious to the effects of sun, rain, frost or snow - the first and only choice of timber for outdoor furniture. In addition to the well-known quality teak furniture, Gloster also offers furniture from ceramic or metal and tops the furniture offer with a great range of outdoor carpets, LED lanterns and parasols. Furniture novelties for 2019 include Dune, Kay and Maya. A bohemian influence defines the style, with softness and spontaneity added via specially developed fabrics made with 3D knitting technology. Supreme comfort is achieved using upholstered cushions, quilted blankets and soft pillows placed within and on top of an aluminium frame with a teak base. Dune is all about the dialogue. The initial idea for the collection was the scenario of having a good time with friends on the terrace - enjoying a cocktail and nice conversation in amazing comfort. The backrest is unquestionably the defining statement of the Kay range. Deliberately oversized and beautifully curved for comfort, Kay embraces you as you sit offering comfort and shelter. Available in either Brindle, Harvest or Copper colour ‘French Cane’ style all-weather wicker combined with a delicate teak frame, Kays lines combine timeless style with practical comfort. The Kay collection is comprised of a two seater sofa, an armchair and an ottoman. High and low variations of the back panel are available as options and can be used to create a fully consistent level or a variation in back heights depending on how you wish to style your space. When the Cloud range was launched in 2010, it incorporated new thinking and technology in the design of the upholstered elements and made these as comfortable as their interior cousins. Cloud not only invented the ‘outdoor lounge’ category, it went on to define it. So how do you improve this? It is often easier for a designer to start again rather than take an existing design and make it better. This was the challenge; the gentle, but meaningful evolution of an existing idea. To distil and keep the spirit of the original, but refresh the aesthetic and expand its possibilities. The Maya frame features an ultra-slender powder coated aluminium profile connected to cast aluminium legs. Side and back cushions are subtly revised in profile and detail and additions to the range include console tables and planters that allow for a series of living landscapes to be created outdoors. We will be happy to see you all at Salone del Mobile 2019, Hall 2.2 Stand D31-D35 , where we will be presenting all highlights for the upcoming outdoor season! Please do not hesitate to contact me to schedule a meeting at the stand!